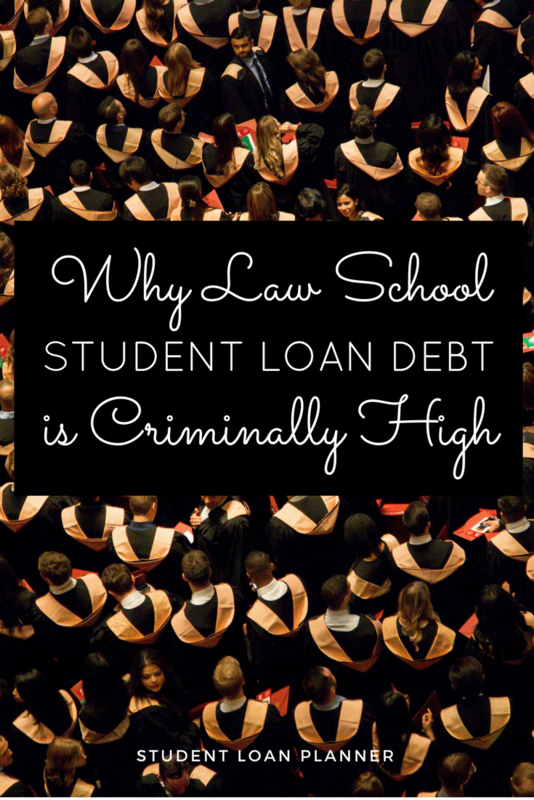 Any soon to be or newly minted JD can tell you that law school student debt is criminally high. However, the range of the offense is large and varies from 3rd degree misdemeanor to 1st degree murder. On one hand, there are law schools like University of Alabama, where new graduates have a little over $69,000 in student loans and salaries of $105,000 in the private sector. On the other, there are schools like Florida Coastal, where new graduates leave with over $160,000 in student loans and starting salaries of $45,000. I’ve made law school student debt plans for general counsels at hospital systems, corporate lawyers at oil companies, government lawyers, and grads still seeking a JD required position. If you wanted to learn more about how I help my average client save over $100,000 on their student loans, contact me. Your law school student debt strategy depends on what kind of job you have and how high your debt is relative to your income. Here are typical profiles I see during consults for law school student debt. If you look at the top law schools in the country, the cost of attendance is very high but most graduates also obtain a very high starting salary if they enter the private sector. As an example, Harvard Law grads start at $160,000 on average if they take a private sector job. They also graduate with almost $150,000 in law school student debt. Even though a Harvard Law degree is expensive, the average debt to income ratio is a manageable number at below 1. Unfortunately, there are problems with using an average to understand a population of borrowers in a widely varying distribution. Law school student debt certainly poses this statistical problem. One of my friends who attended a top law school graduated with around $230,000 in law school student debt, and he didn’t even live in a high cost of living metropolitan area. My guess is that his circumstances are similar to a huge percentage of students in law school who don’t have significant family contributions to their education. If you exclude the folks with less than $50,000 in loans, then the average law school debt number would soar. So let’s assume that Sarah went to Columbia Law School and took a job at as an associate at Cravath, Swaine & Moore making $180,000. We’ll say she graduated with $250,000 in law school student debt at an average interest rate of 7%. Why does it make sense to refinance her student debt if she plans on staying on the Big Law track for several years? Check out this simulation from my propriety spreadsheet I use in consults. By refinance her law school student debt, Sarah is able to cut the total cost of her law school education in half compared to the most expensive income based repayment option. If you make a high income in the legal field, expect very few federal benefits or subsidies for your student loans. The federal government is expecting you to be lazy and use the standard 10 year repayment plan with 6%-8% interest. If you can manage to stay in a Big Law job for at least a few years, you could knock out your student debt and be done with it. Check out the best refinancing deals for law school loans by clicking on the link. As a professional student loan consultant, I have special public and non public negotiated arrangements that I use to save clients a ton of money when they refinance. I would caution against going through the process yourself as at the minimum you will miss out on a cash bonus for refinancing that you won’t get by visiting the website. At worst, you’ll be like the one client I helped who had already refinanced over $300,000 in student loans on his own at a 4.8% variable rate. I helped him find a 3.04% variable rate. Shopping around has huge advantages. If you wanted to take advantage of the public negotiated deals that I have, check your rate with any of the major refinancing companies listed at the very end of the article. I’ve helped a lot of lawyers cut their interest rates by as much as 50%. I’d prefer that you’d hire me to do a consult and help you shop for offers, but if you’d rather do it yourself, just know that you can check your approximate rate with multiple lenders with a soft check that doesn’t impact your credit score. If you want a final offer, you’ll have to submit to a hard check, but you can do that multiple places within a 30 day window and only have it hit your credit score once, and even then it’s a temporary blip. A sizable percent of new law school grads work a couple years in the public sector before moving onto more lucrative opportunities. If you have law school student debt, the strategy should be to keep this debt from growing while keeping all your options open for the future in case what you thought was a temporary stay in the public sector becomes more permanent. There is a large opportunity cost of beginning your career in public service. Your ability to earn a high income should influence your law school student debt strategy. You’re either going to want to use the government repayment programs to minimize your loan balance when you eventually take a high paying private sector job, or you’ll want to pay as little as possible to maximize tax free student loan forgiveness under the Public Service Loan Forgiveness program. Say you plan to clerk for a federal judge for a couple of years after law school and then take a Big Law or other private sector job. Most people probably use deferment or forbearance then make larger monthly payments once their tax return shows a larger income as a second year associate. Such a strategy costs thousands of dollars in unnecessary interest payments. Instead, that person could use the Revised Pay As You Earn plan as a law clerk to pay close to nothing on their law school student debt balance while receiving a subsidy of up to 50% of the annual interest accrual on their loan balance. Once they sign their Big Law offer, they could shop around at 4-6 private refinancing companies to make sure they’re getting the best interest rate. Then they could pay their loans down over 5 years. Such a strategy would result in tens of thousands in savings. If the law clerk used forbearance or deferment, interest would continue to accrue on their loans at the full rate. They would receive no credit towards potential loan forgiveness either. I would almost be willing to wager that a majority of young lawyers entering public service on a temporary basis put off making payments on their student loans to their detriment. If your stay in public service is more permanent such that you plan to work at least 10 years in the public sector, take advantage of the Public Service Loan Forgiveness program (PSLF). You have to make 120 monthly payments over at least a 10 year time frame under a qualified federal income based repayment plan to qualify. After doing this, your remaining student loan balance is forgiven tax free. This is the best student loan benefit ever created. It’s so good that it will probable be curtailed soon for future borrowers. Hence, if you might be eligible please send in the PSLF employment certification form to track your progress towards this incredible benefit now. Is PSLF Going Away for Lawyers? People ask me all the time if PSLF is going away because of lawsuits like the one by the ABA lawyers who were denied after a couple years of qualified service credit from FedLoan Servicing. I don’t have a crystal ball to tell you. What I do know is that both parties have tried to change or eliminate it outright. They only disagree on how to do it, which is why PSLF is still around. President Obama wanted to cap the forgiveness amount at $57,500 to limit the attractiveness of PSLF for high debt graduate students. The Republican Congress wanted to repeal PSLF entirely for all new borrowers. PSLF is written into promissory notes for student loans, and even the most aggressive repeal efforts have exempted those currently tracking their progress in the program. Hence, I would feel pretty good about PSLF being around as long as I didn’t need to take on additional education debt. You might have heard about the PSLF lawsuit brought by the American Bar Association. The takeaway from that lawsuit for me is that you need to only work at a 501c3 or government employer and you’ll be good. Brian would seek to pay as little as possible for the 10 year repayment period by using the PAYE or REPAYE plan to keep costs low. The total cost for his law school education in this case would only be $48,075, less than one third the cost of what he borrowed. Going the public service route is definitely the cheapest option to pay back law school student debt. However, the trade-off is of course lower pay. Mid and small size law firms are more diverse than Big Law firms. Debt to income ratios will vary wildly for new lawyers working in this setting, as will the student loan payback strategies. If you owe more than 150% of your income, you probably will want to optimize your loan situation to take advantage of the government income based repayment options. You’ll also want to plan for the large tax penalty you’ll owe at the end of the 20-25 year period during which you’re working for private sector loan forgiveness. Forgetting that the IRS treats the forgiven balance as taxable income is one of the biggest student loan mistakes that lawyers make. You can plan for this if you set aside a fixed monthly investment in a ‘tax penalty’ account. If you owe less than 150% of your income, you need to run a net present value analysis to see how much you could save if you refinanced to a lower interest rate. Also ask yourself how much cash flow do you have to throw at law school student debt? If you have a lot of money left over after covering your living expenses, then you are an excellent candidate for refinancing. Get the Free Law School Student Loan Calculator! Just to see what life could look like for a private law school grad working at a small regional law firm, meet Miranda. She has $200,000 in student debt from taking out extra loans to cover her living expenses for her family. Her salary is $70,000, but she expects that to increase to $100,000 over the next five years. The problem with Miranda’s debt is that she doesn’t have a lot of money left over to make student loan payments after paying taxes and living expenses. In contrast, a higher paying Big Law job might be in a high cost of living area, but at least there’s cash flow left over at the end of the month. Miranda will have to accept going for private sector loan forgiveness because that’s the only option she can afford. The five year private refinancing monthly payment would be over $3500 a month. The standard 10 year payment would be over $2000. Miranda can probably not afford either path with her $70,000 salary. If she chooses PAYE, she’ll watch her balance grow at a fast rate. After 20 years, the $419,000 balance will be added to her income on her W-2, and she’ll owe the top marginal income tax rate on this income. In other words, she will need to write a check for over $200,000 to the IRS. Many lawyers using this de facto law school student debt repayment strategy have no plan on how they’re going to pay that tax bomb. I help folks realize what they need to save in an investment account each month in order to avoid wage garnishments, bankruptcy, or other financial hardship in the future. It’s not as popular as it used to be, but many lawyers still ‘hang out a shingle’ and start their own practice or take one over. For lawyers in this position, the primary challenge in terms of paying down law school student debt is income variability. Most solo practitioners will not make all that much money in their first few years. In that case, a solo practitioner lawyer with a high debt to income ratio expecting a much higher income in the future would do well to take advantage of interest subsidies through the REPAYE program. After your income surges, look for a good private refinancing deal and pay it off as fast as possible. 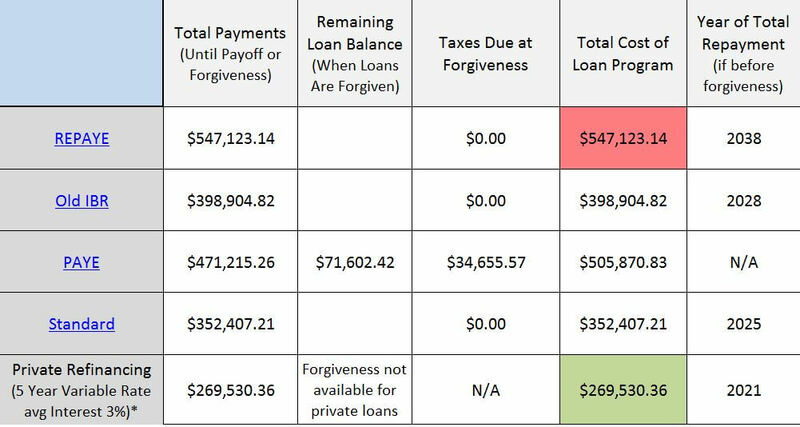 If you expect your income to stay modest for a long time relative to your law school student debt, then maybe look into the PAYE private sector loan forgiveness strategy. You would put aside at least $1,000 a month in a tax penalty account to pay the huge balloon tax payment at the end of the 20 year period during which you make payments. Either way, thanks to the government income based repayment programs and private refinancing options, solo practitioners lawyers need not be discouraged from running their own operation. I’ve worked with several law school grads with substantial law school student debt who are not working in legal jobs. For some, this is a personal choice. However, most folks in this category have been looking and just can’t find a good legal position so they take a job that they could have obtained with their undergrad degree. For many who owe far more than what they’re making, it’s all about maximizing the government benefits and having a strategy in place to manage the growth of the balance. 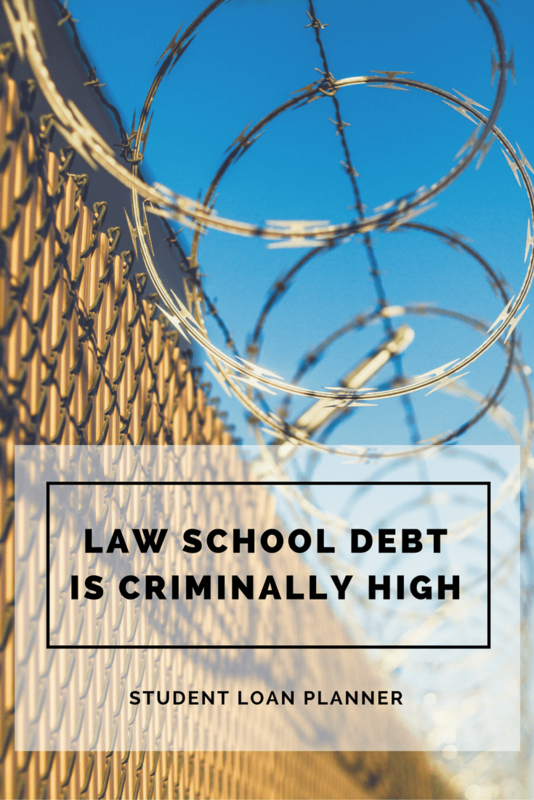 In rare cases, if you attended one of the private law schools that produce bar passage rates below 50% and have poor employment statistics, there’s an outside chance you could have your debt forgiven. If the school is shut down for fraudulent misrepresentation of their program by the Department of Education, the government could wipe away what you owe tax free. There is a very low probability of this happening. However, if enough people complained to the Department of Education, there’s always a chance so I thought I would mention it. If you graduated from a law school that you believe lied about their employment statistics, bar passage rate, or otherwise defrauded you, I would encourage you to contact the Department of Education Ombudsman. Some folks who graduate from law school and work in a position that doesn’t require the degree make a lot of money too. In that case, if your income is high relative to your debt, then private refinancing probably makes sense. However, I fear that the more common situation is the high debt and low income scenario. Meet Tom. He went to a for profit law school in a high cost of living area, so he borrowed $220,000 to finance his law school degree. After graduation, he wasn’t able to pass the bar, so he took a job that he could have gotten after going to undergrad. His annual salary is $50,000, which he expects to rise to $65,000 if he stays with that company. His debt like all the others before is at a 7% interest rate. Clearly, Tom would have been better off not going to law school. Rather than dwell on this fact, I want to focus on how Tom can save as much money as possible. If Tom went to a for profit law school with potentially fraudulent employment statistics, I’d encourage him to complain to the Dept of Education and get his friends to do so too. Consider that a Hail Mary strategy. With the realistic plan B, I’d look at the repayment options under the federal income based repayment programs. If there’s any chance Tom would tolerate working in the not for profit sector for 10 years, that is by far the most optimal strategy with his debt. If he liked his job and wanted to stay in the private sector, then he would want to go with REPAYE or PAYE. I like REPAYE for his situation because of the interest subsidy available that keeps his loan balance from growing out of control. REPAYE also minimizes what he will have to pay in the future to the IRS. If you wanted a copy of the calculator I used to simulate everything above, get it for free here. Clearly the best two career paths to pay back law school student debt are Big Law and Public Sector Law. With Big Law, the way to save the most money is to refinance and tough it out for a few years while making large $2500-$3500 monthly payments. With Public Sector Law, you want to make sure your loans are eligible for forgiveness under the PSLF program and submit the employment certification form immediately after receiving your first paycheck. The good news is that there’s hope too for folks with smaller salaries relative to what they owe. If you have a lot of debt and work in a small or mid sized law firm, assuming you don’t get a good refinancing offer you’d want to put away money every month in a ‘tax penalty account’ to pay the tax bomb for private sector loan forgiveness. You’d want to choose the repayment plan that minimizes the net present value to minimize the cost to you for your legal education. If you owe a lot of law school student debt and cannot find a legal job, the strategy is similar to that of the highly indebted small/mid sized firm lawyer assuming your income is low. You’ll want to maximize your federal student loan benefits by choosing the right repayment plan for your situation. If you felt like your law school completely lied to you, then attempt the Hail Mary pass and try to rally fellow grads to submit complaints to the Dept of Education to get the school labeled as fraudulent. Law school student debt is criminally high, but luckily you can use these tips or hire someone like me to mitigate the penalty. If you would like to share other ways you’ve saved money on your law school student debt, ask questions about the article, point out any misconceptions I may have (after all I’m admittedly not a lawyer, I just understand how to program excel and make financial models as an ex-bond trader), or just vent about how ridiculously expensive it is to become a lawyer, hit up the comments section below. I want to help as many lawyers as possible save money on their law school debt. I’ve consulted with hundreds of people and have saved clients millions over the life of their loans. I charge a flat fee and find the best repayment option for you. If you are facing a six figure law school student debt burden, click the below and contact me. It’s so easy to make a mistake, and you’ll save a ton of time that you would have wasted trying to figure this out for yourself. Awesome job with this detailed post! The repaye interest subsidy is something I was not aware of, and something interesting that people clerking for a year can do before they go on to make the big bucks in biglaw. I might need to reach out to you to get some more info about that, if that’s okay. PSLF is likely the way to go if going the public interest route, but I have a concern as a lawyer from a risk standpoint. Since it requires 10 years, it seems really risky (and we lawyers are inherently not a risk taking bunch). Law jobs, unlike medical jobs, are inherently unstable. Take a look at any lawyer profile on LinkedIn and you’ll see that people jump between jobs very regularly. I’m only 3.5 years out of a law school, and I have friends who’ve already had 3 or 4 jobs, including jumping between private and public sector jobs. I have no stats to back it up, but I wouldn’t be surprised if your average law grad today ends up with 3-5 jobs in their first decade of practice (I’m already at 2 jobs and could easily see myself at 3 or 4 before it’s all said and done). So my concern for the PSLF route, since law requires you to be nimble, what happens if you end up needing to jump out of the public sector during that time? (either you get fired, need to make more money, administration change, hate law, whatever). In my opinion, if you’re going to law school and taking on significant debt, you need to do everything you can to get biglaw and pay off those loans fast. Refinance just like you said and then just crush them. That’s the route I took anyway. I just think the law game is really unstable for someone to rely on PSLF. Hey kevin feel free to reach out anytime with questions. You have a great blog btw any lawyers reading should check it out. PSLF as it stands does not need to be consecutive years of service and it can also be with different employers. Hence, a law grad switching back and forth between the public and private sector could take a while to pay it back and still take advantage. However, that’s not an optimal strategy. The financially maximizing route is to pay down your debt fast with a Big Law job and then save as much as you can to transition to a different position. The second best is to use a not for profit job for 10 years to get rid of your debt tax free. 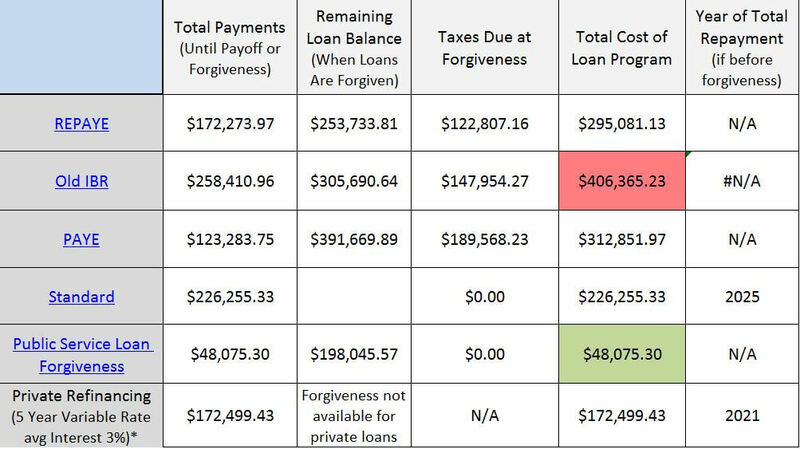 The worst options financially (that are sometimes necessary bc they’re the only options) are to use private sector loan forgiveness because of the tax penalty. Let me know if you had follow up questions. I completely agree that the current cost of law school is egregious. Given the bleak realities of law school debt and employment statistics, it’s no surprise that there are many “JD haters” out there. Prospective students MUST do their research and make an informed, deliberate decision about if/where they attend law school. As I do my own research, this post is by far the most useful resource I have found on law school debt! Thank you for addressing the often neglected nuances of financing a JD. So many bloggers take an extreme stance on the issue: they condemn law as the “worst decision you can make” or whitewash unsavory truths with false stats. I appreciate that your analysis is both honest and nonjudgmental. In the future, I would love to read about the impact of gender in paying off law school debt! For sure. I think there’s a great case to be made for going to a top 10-15 school and working in Big Law for a few years. There’s also a good case to be made for attending the best law school in the state you want to practice in. Other reasons to attend law school are not as sound. A 5 year variable rate on a loan is a terrible idea! As soon as interest rates go up (which is probable since the Fed indicated as much) you get clobbered/ screwed (see mortgage crisis). That kind of fuzzy math is why people should either take a basic finance class (and understand NPV analysis and time value of money) or get an MBA (which is not a great alternative but is not as bad) especially when law school debt is about 160k and median salaries are only 65k. I think the main takeaway is don’t get your JD unless you can model out your debt repayment and can live with it. But interest payments on debt are front end loaded. Unless an individual purports to know more than the bond markets about the direction of interest rates, we’re likely to have moderate 30 day LIBOR for at least the next couple years. I’d disagree in that a 5 year variable rate forces you to make big payments and removes much of the interest rate risk from the equation as the principal gets paid down rapidly, thus removing the possible downside of interest soaring on you. In general, I tell folks do a 5 year variable if you can afford to pay it down in half that time if you wanted to.